Color coding in this map of a far-southern site on Mars indicates the change in nighttime ground-surface temperature between summer and fall. This site, like most of high-latitude Mars, has water ice mixed with soil near the surface. The ice is probably in a rock-hard frozen layer beneath a few centimeters or inches of looser, dry soil. The amount of temperature change at the surface likely corresponds to how close to the surface the icy material lies. The dense, icy layer retains heat better than the looser soil above it, so where the icy layer is closer to the surface, the surface temperature changes more slowly than where the icy layer is buried deeper. On the map, areas of the surface that cooled more slowly between summer and autumn (interpreted as having the ice closer to the surface) are coded blue and green. Areas that cooled more quickly (interpreted as having more distance to the ice) are coded red and yellow. The depth to the top of the icy layer estimated from these observations suggests that in some areas, but not others, water is being exchanged by diffusion between atmospheric water vapor and subsurface water ice. Differences in what type of material lies above the ice appear to affect the depth to the ice. The area in this image with the greatest seasonal change in surface temperature corresponds to an area of sand dunes. This map and its interpretation are in a May 3, 2007, report in the journal Nature by Joshua Bandfield of Arizona State University, Tempe. 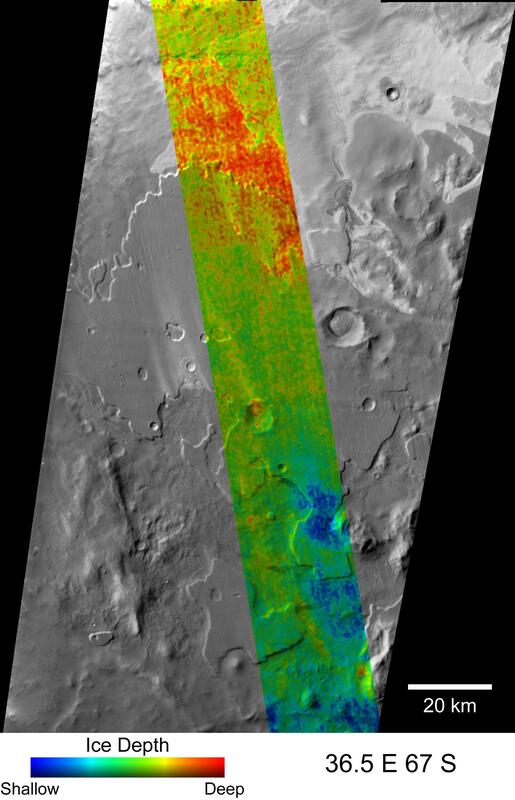 The Thermal Emission Imaging System camera on NASA's Mars Odyssey orbiter collected the data presented in the map. The site is centered near 67 degrees south latitude, 36.5 degrees east longitude, near a plain named Melea Planum. This site is within the portion of the planet where, in 2002, the Gamma Ray Spectrometer suite of instruments on Mars Odyssey found evidence for water ice lying just below the surface. The information from the Gamma Ray Spectrometer is averaged over patches of ground hundreds of kilometers or miles wide. The information from the Thermal Emission Imaging System allows more than 100-fold higher resolution in mapping variations in the depth to ice. The Thermal Emission Imaging System observed the site in infrared wavelengths during night time, providing surface-temperature information. It did so once on Dec. 27, 2005, during late summer in Mars' southern hemisphere, and again on Jan. 22, 2006, the first day of autumn there. The colors on this map signify relative differences in how much the surface temperature changed between those two observations. Blue indicates the locations with the least change. Red indicates areas with most change. Modeling provides estimates that the range of temperature changes shown in this map corresponds to a range in depth-to-ice of less than 1 centimeter (0.4 inch) to more than 19 centimeters (more than 7.5 inches). The sensitivity of this method for estimating the depth is not good for depths greater than about 20 centimeters (8 inches). The temperature-change data are overlaid on a mosaic of black-and-white, daytime images taken in infrared wavelengths by the same camera, providing information about shapes in the landscape. The 20-kilometer scale bar is 12.4 miles long. NASA's Jet Propulsion Laboratory manages the Mars Odyssey mission for NASA's Science Mission Directorate, Washington, D.C. The Thermal Emission Imaging System (THEMIS) was developed by Arizona State University in collaboration with Raytheon Santa Barbara Remote Sensing. Lockheed Martin Space Systems, Denver, is the prime contractor for the Odyssey project, and developed and built the orbiter. Mission operations are conducted jointly from Lockheed Martin and from JPL, a division of the California Institute of Technology in Pasadena.